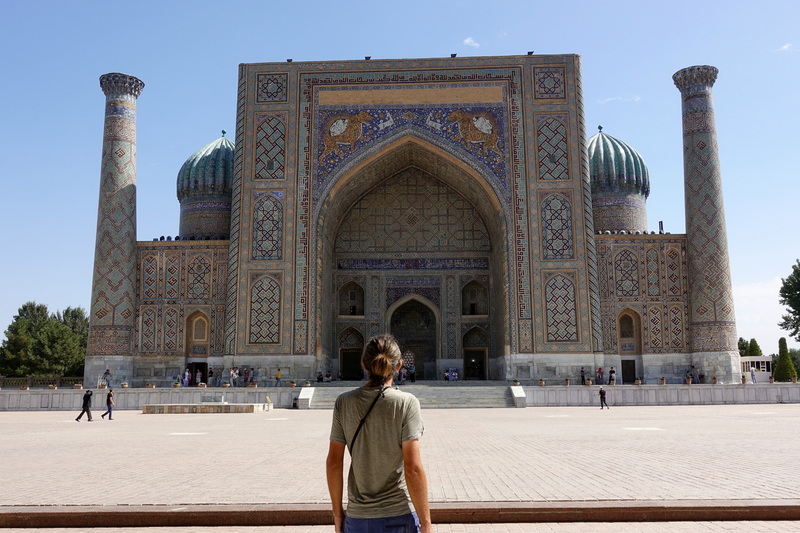 After regrouping in Qarshi and sorting ourselves out, we decided that we needed to see more of the touristic highlights in Uzbekistan. 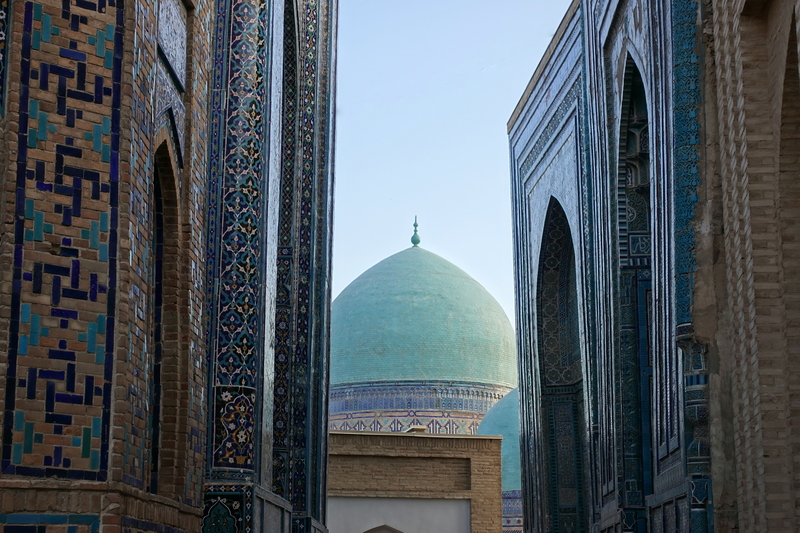 When people come to Uzbekistan, they’re mostly there to see the dozens of large, blue tiled madrasas that conjure dreams of a Silk Road oasis. 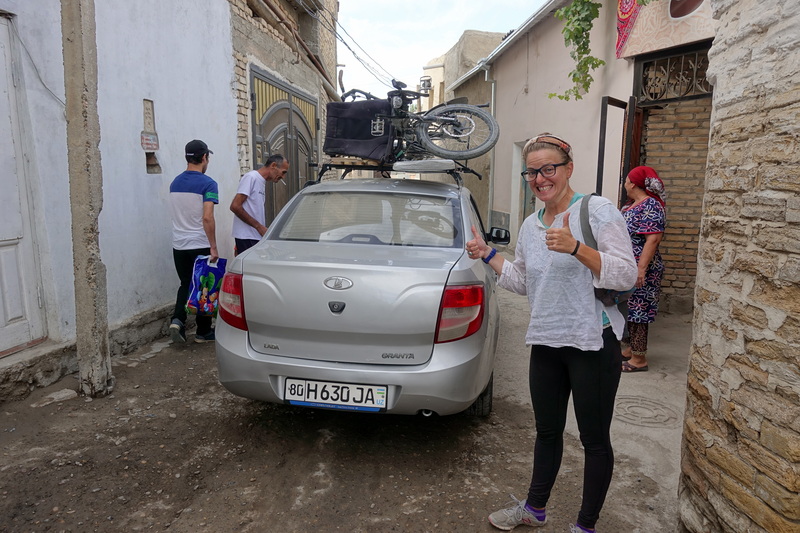 Since only two of the three towns were on our cycling route (Bukhara and Khiva), we needed to hitch a ride to Samarkand. 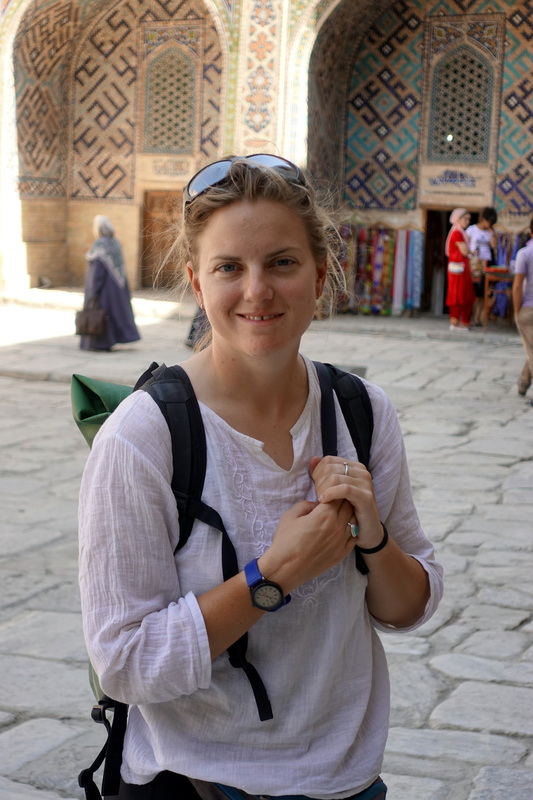 The evening before we left, we discussed how we could manage to go to Samarkand with our host and he offered to set us up with a taxi. 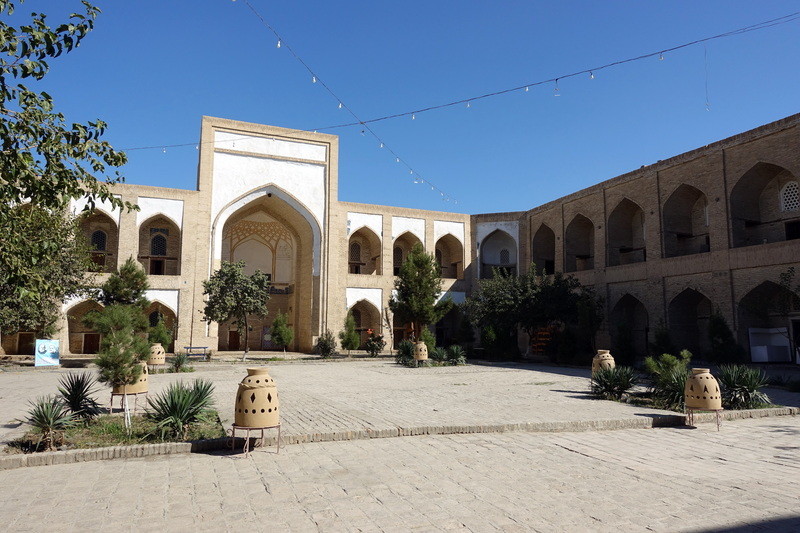 The next morning, we got our things ready – leaving the non-essentials at the hotel – and headed out to the taxi stand in Qarshi. In Uzbekistan, there are some ‘formal’ (this term is really loose) yellow taxis who will quote a price per kilometer, or ‘shared taxis’ that will take a group of people going a longer distance. Some men will drive a certain route between cities as their job, or people use the opportunity to make a little money through carpooling. Basically, any car that is not yet full (of humans, bags, or sheep [yes, we have seen sheep]) can be turned into a taxi just by waving at it. 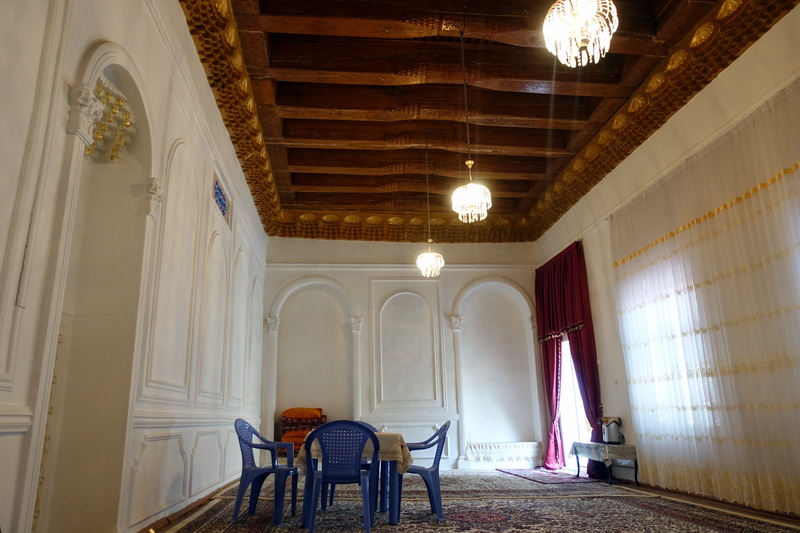 The hotel owner was kind enough to drive us to the taxi stand in the morning and negotiate reasonable price to get to Samarkand ($4.50 per person for a 2-hour ride). Once our car was full, with two other riders, we set off. 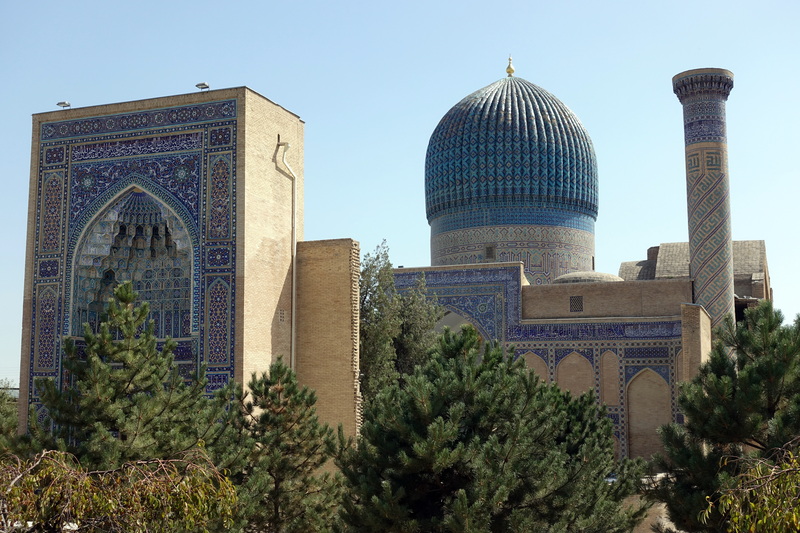 Just as we were pulling onto the road, I made a joke to Cédric asking whether we needed to pray for getting to Samarkand safely (because we’ve seen how reckless Uzbek drivers are), but right on cue, the three other guys in the car raise their palms to their face and say a short prayer. 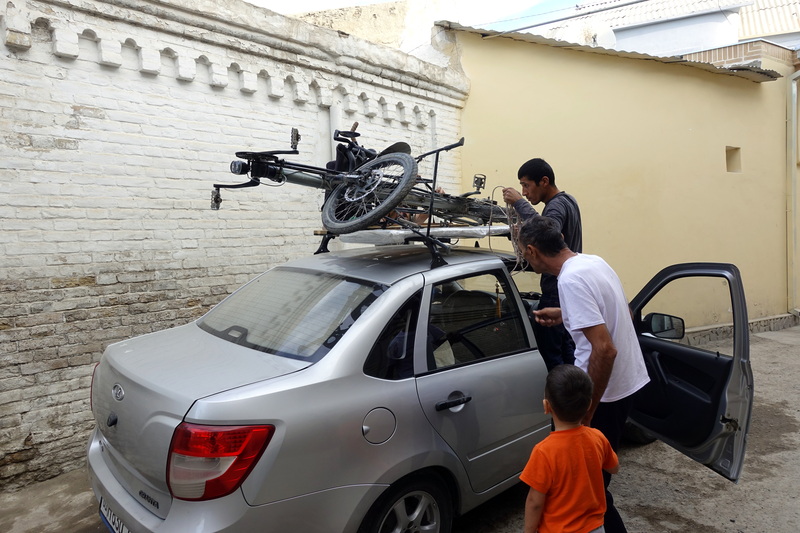 I suppose it’s the Uzbek form of ‘Jesus take the wheel.’ Our ride was fast, and I had white knuckles the entire time. In Uzbekistan (and the rest of Central Asia), there are few to no seatbelt regulations, so the back seat of older cars have no seatbelts (I guess that save a few dollars of the car price…), and the two in the front seats don’t wear theirs either. 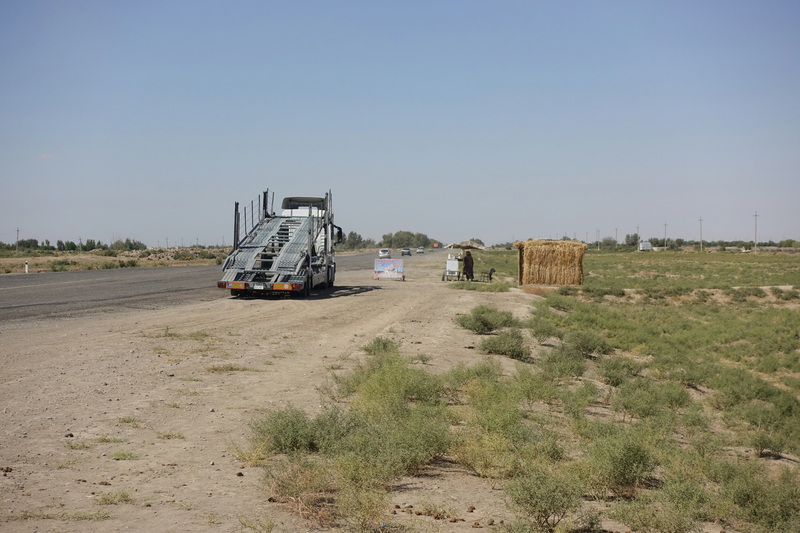 Even if there is a police checkpoint, the belts are utilized for maximum 2 minutes as drivers go past, and police checkpoints are fixed, so all year-long at the same place – in short, seatbelts are a complete nonsense for an Uzbek. To complement the lack of safety, the ability to pass people seems to be an extension of manhood (my observations), so at every given chance, the driver will accelerate, no matter what the current speed is, no matter the road condition, no matter the traffic, no matter how close to the limits the Lada currently moves. I was uneasy barreling down the highway in the middle seat without any sort of protection. Cédric, however, managed to pass the time by nonchalantly playing games on his phone – “There’s not much I can do anyway, so Alhamdulillah!”. 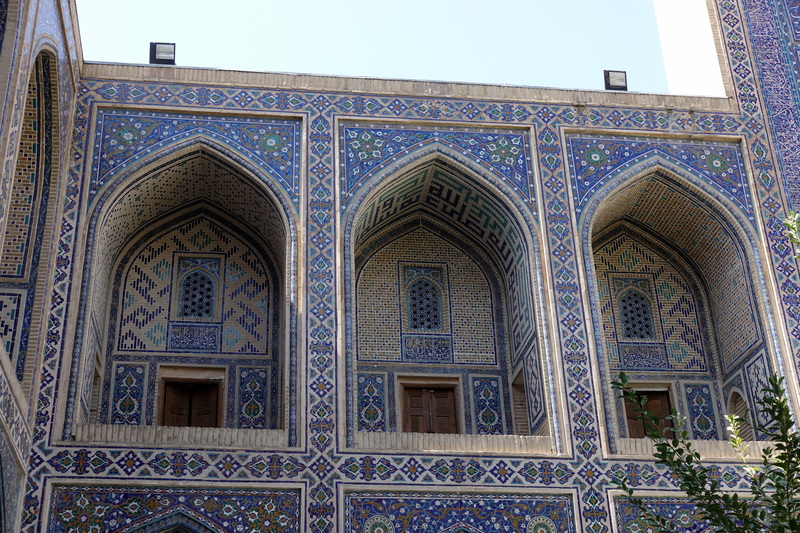 Once we arrived safely in Samarkand, we dropped our things off at our guesthouse and then went to explore the city. 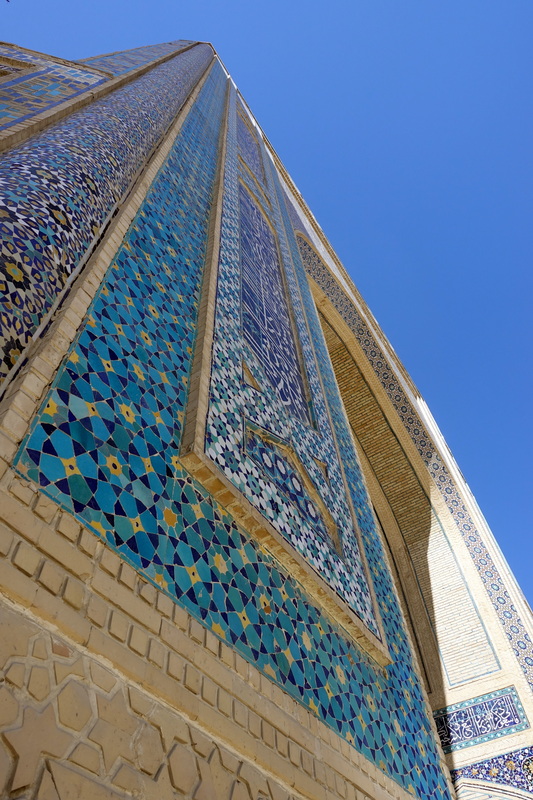 We first stopped at the most iconic part of Samarkand: the Registan. 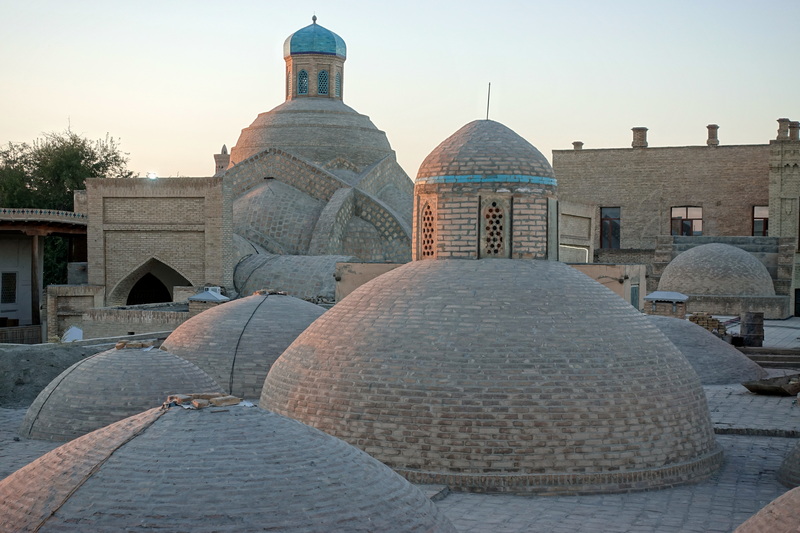 Located in the heart of the city, the Registan is composed of three separate madrasas, dating back to the 15th and 17th centuries. 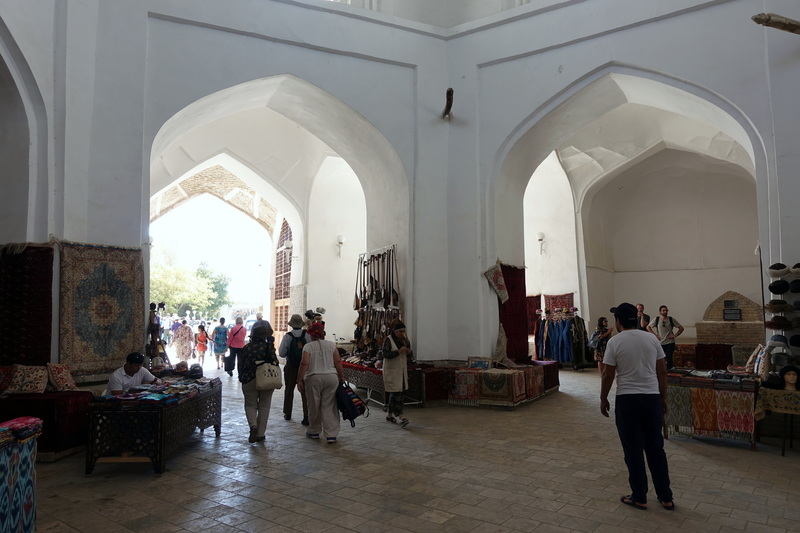 As soon as we stepped into one of the buildings, we saw that the renovated buildings are now used to bunker dozens and dozens of souvenir stalls. I suppose in some sense, it’s nicer having them contained rather than sprawling all over the streets. 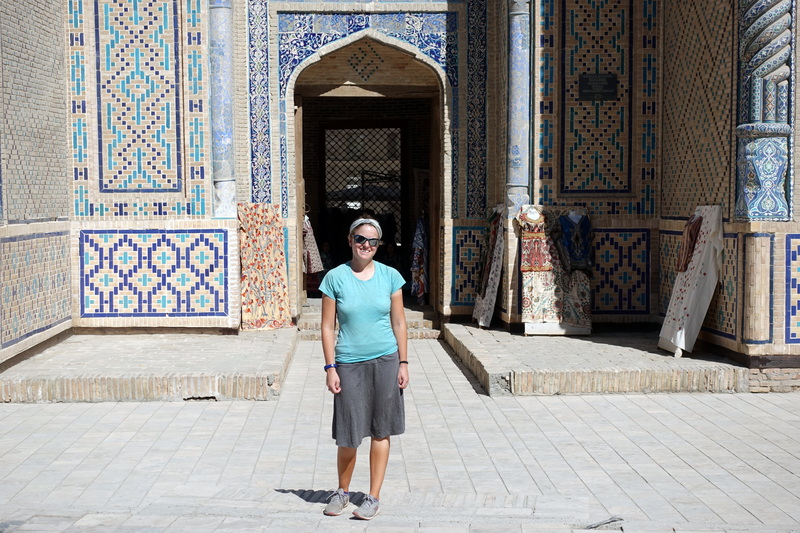 Afterwards, we wandered to Gul-e-Amir, a mausoleum of Timur the Lame, a 15th century ruler. 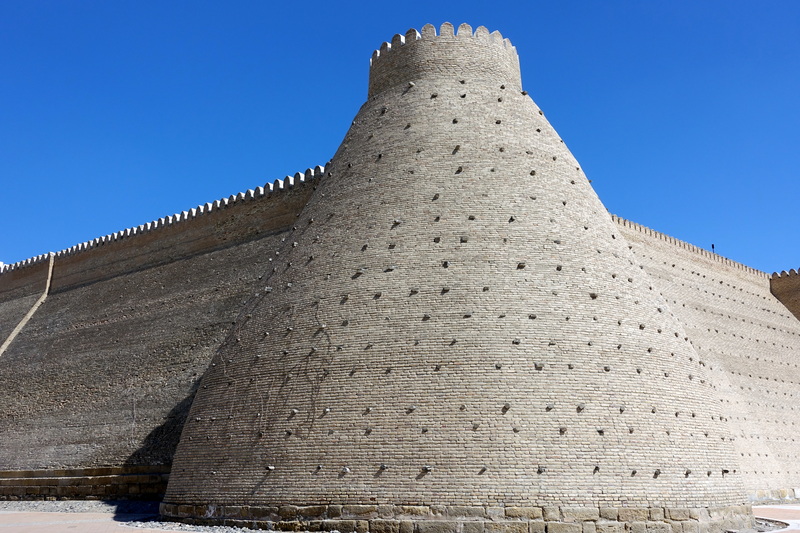 Uzbekistan revers Timur as its greatest hero, but the rest of world agrees to say that this ruler was seriously insane – he killed during his reign 5% of the world population… History is full of controversial figures heroes somewhere, madman a few hundred kilometers further. 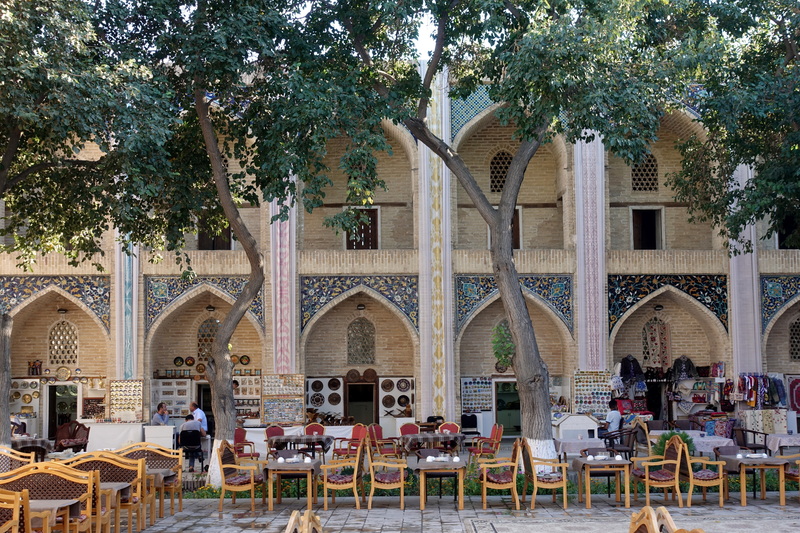 For lunch, Cédric and I got the tourist experience by getting ripped off by a restaurant that conveniently didn’t have a menu with prices (meaning that we had the most expensive plov so far), we probably had spent too much time with trustworthy Tajiks and Kyrgyz. 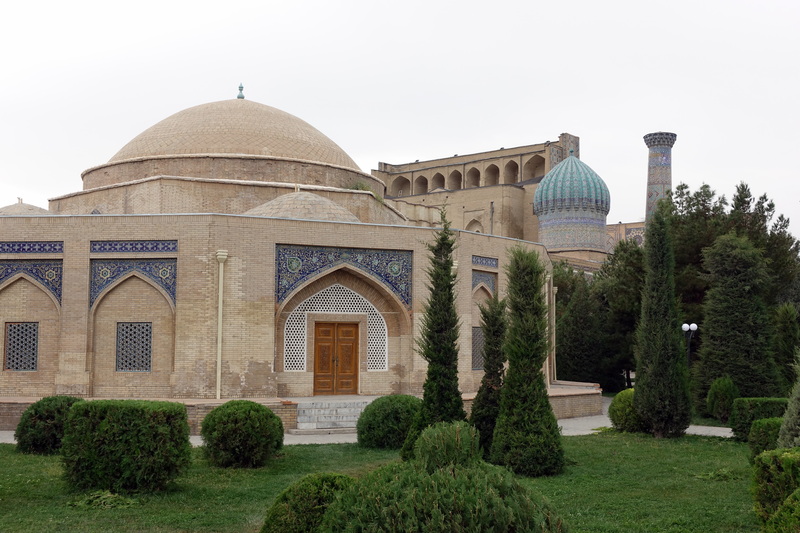 The rest of the afternoon was spent near the Afrasiyab area, peeking around more madrasa, mausoleums, and the late President Karimov’s tomb. It was a bit weird to sit with Uzbeks who were praying and crying over this man’s grave, particularly because we wouldn’t consider him a saint (another slightly violence-loving Presictator whose multiple human rights abuses is just the tip of the iceberg). 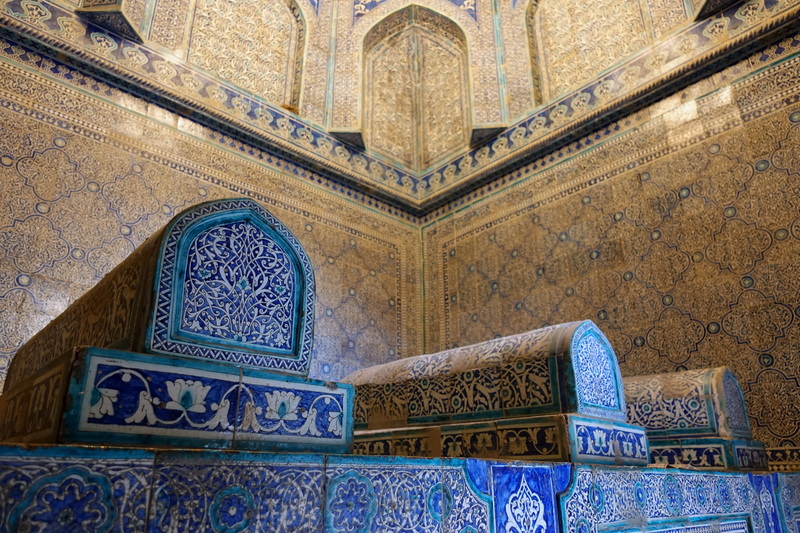 Towards the end of the day, we managed to slip into the Shah-i-Zinda necropolis and see some beautifully tiled mausoleum of some important historical figures. We rounded out our day meeting up with two other cyclists going towards New Zealand and swapping stories of our journeys over dinner. 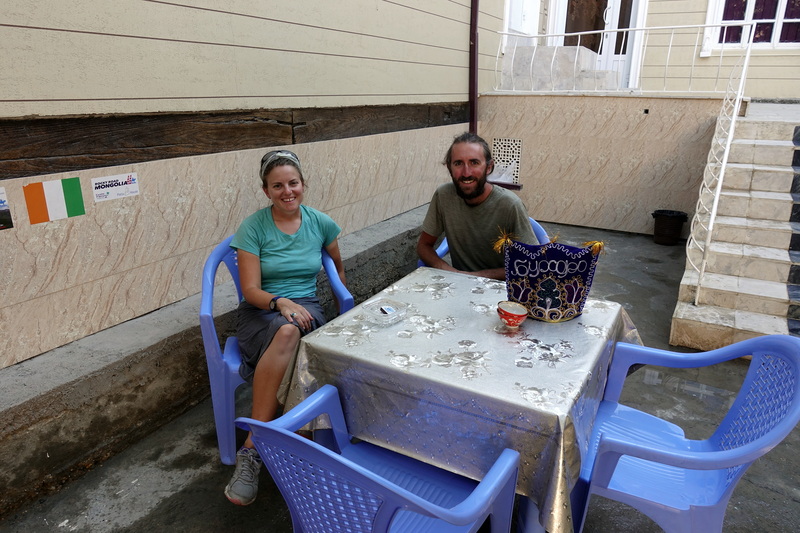 The next day, Cédric was revisited by Uzbek soup stomach, wondering what the volume of the intestine can possibly be (probably some type of weird cornucopia in there…) so we decided to take it easy in the morning and enjoy our guesthouse. Once it was time to leave, we needed to find a taxi to get back to Qarshi. 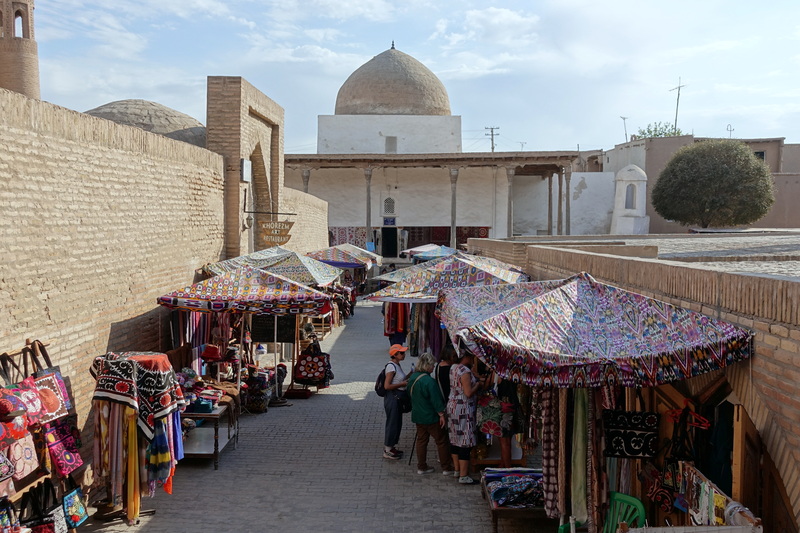 This time, without the aid of an Uzbek to negotiate the prices, and in a city used to have a lot of wealthier tourists not regarding their expenses, we were having difficulties. We went to the nearest taxi stand in the city center and immediately, the taxi drivers were quoting $50… multiple times what we paid to get there. Negotiating down to a reasonable price was also impossible; after I told the driver that the price was insane, and we would only pay what we paid the day before, he smiled and said, “Ok, ok, 500,000 som” (which is $60). 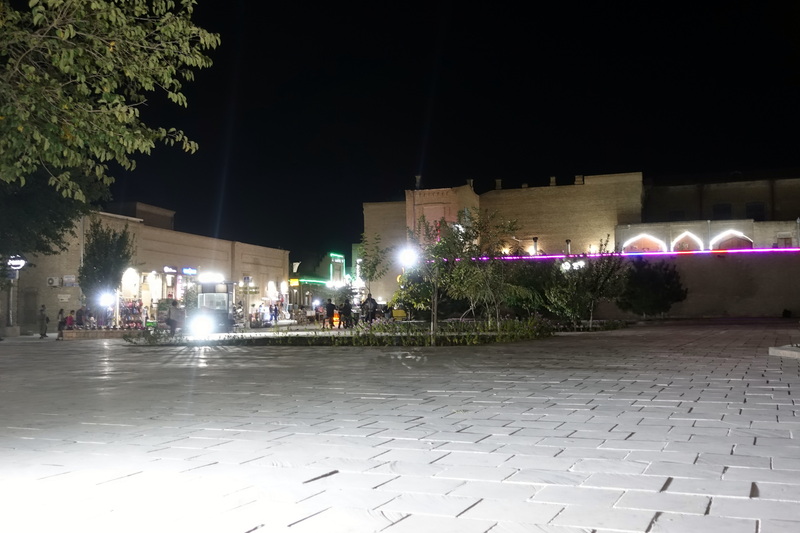 Realizing that we were getting nowhere, we left the taxi stand and started asking Uzbeks on the street how they would get to Qarshi. 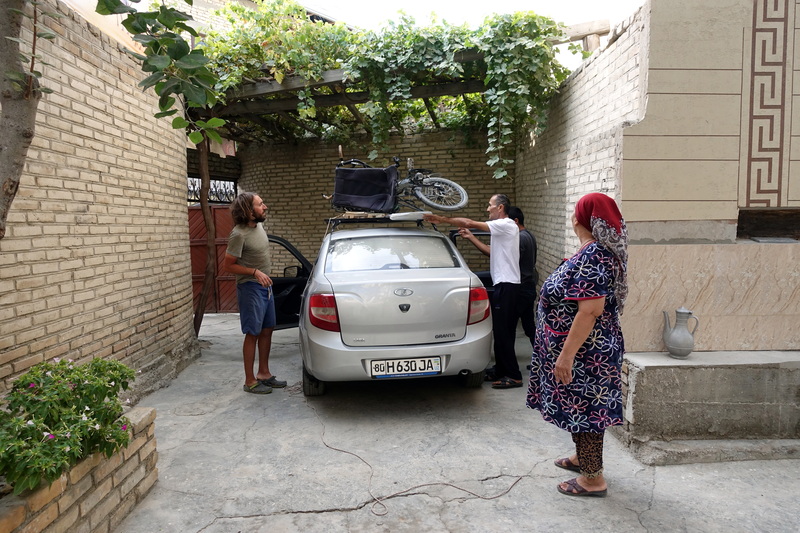 It took about an hour, but we managed to find a taxi that would take us to a taxi stand on the outskirts of Samarkand, where the Qarshi taxis were located. Once there, we piled into a car and sped off towards the south. Thankfully, this guy had an older car, so we weren’t barreling down the highway with impunity. 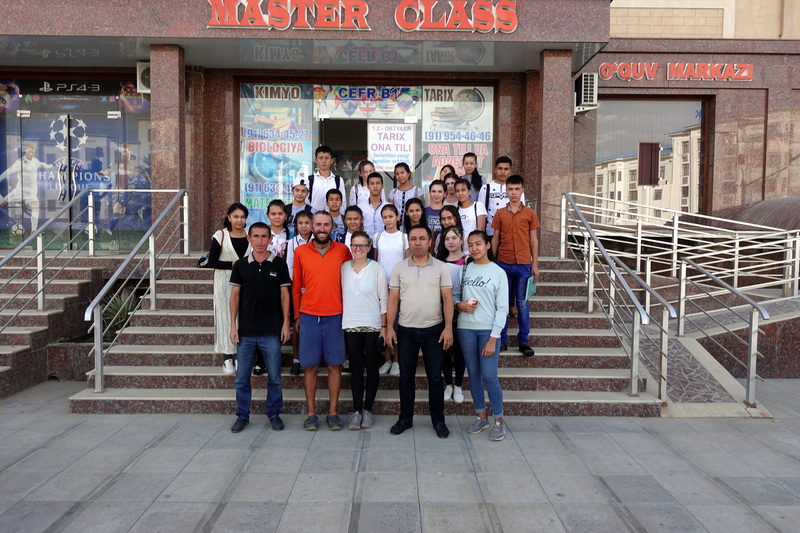 Photo time after our English lesson! In the evening, we rested, had a delicious borsht, and Cédric managed to puke it back up again a few minutes later (but he enjoyed the dinner though, we got used to have multidirectional food capacities). This only enabled him to get a second portion of chocolate sponge cake. 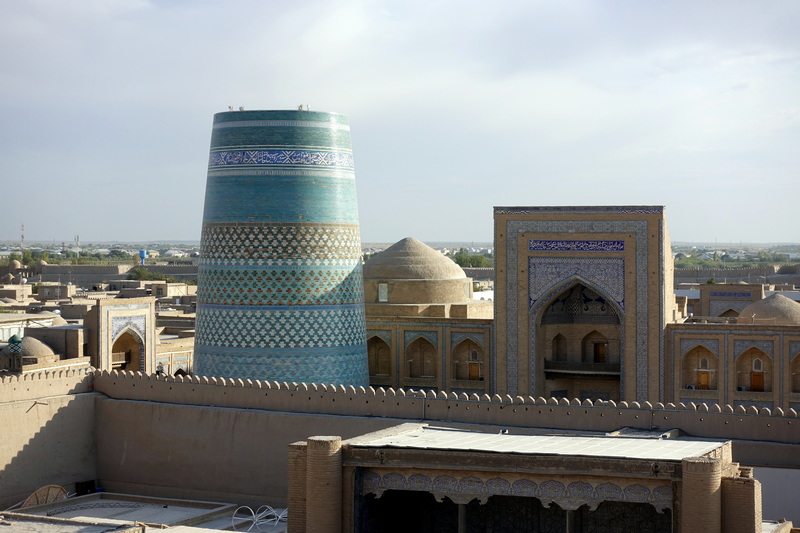 The next morning, we set off for the next touristic town: Bukhara. Once we left Qarshi and started back on the main thoroughfare, the number of villages and farms started to thin out rapidly. 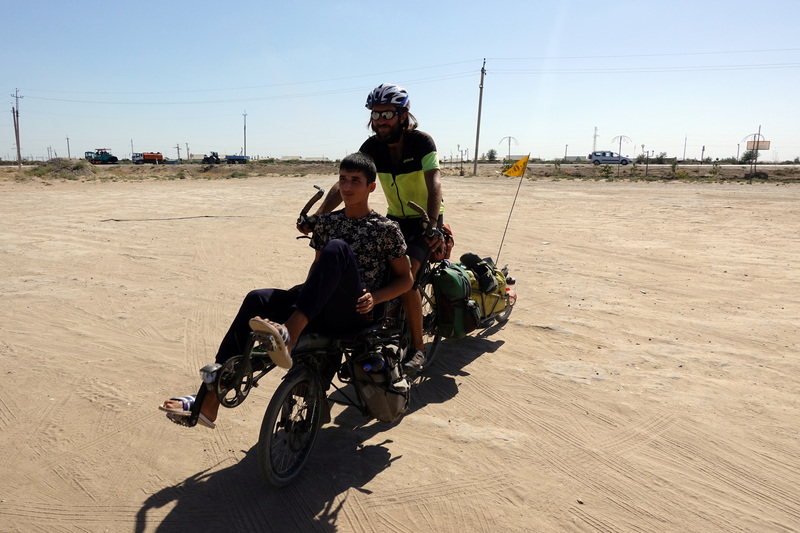 After about 20 kilometers, it was just us and the steppe. 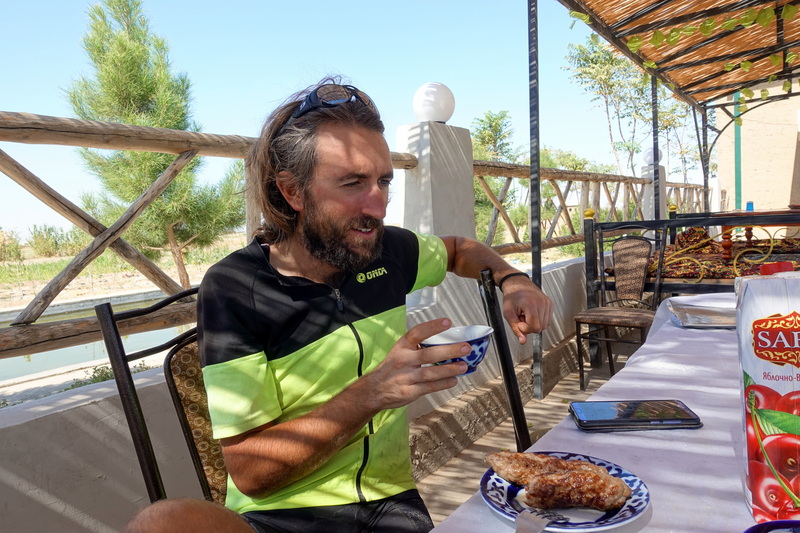 Not ones to learn our lesson, we stopped for lunch at a roadside café and had a helping of mutton kebabs and tea (including a bit of rumination). 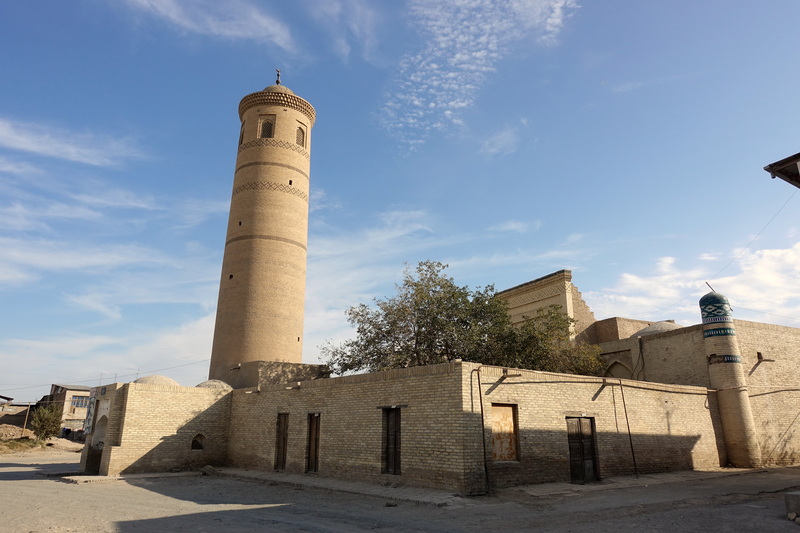 In the afternoon, we cycled into Muborak looking for fuel and food to make it to Bukhara. 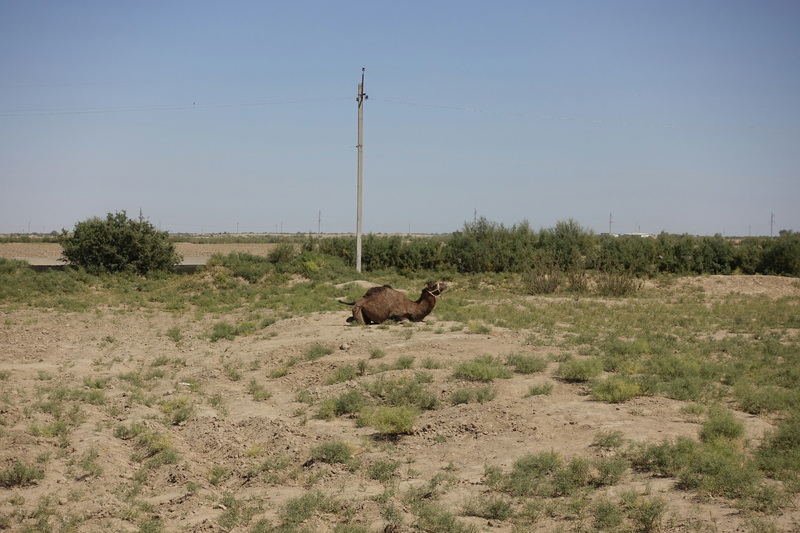 We were surprised to learn that most of the cars and trucks in Uzbekistan run on methane or propane (our ah-ha moment for understanding what the red tanks were under most trucks), so gasoline would be a bit harder to find. On the other hand, that was a good justification as why were all the cars having so clean exhausts! We had very few black smokes in our lungs over the last hundreds of kilometers in Uzbekistan, especially compared with the previous countries running on crappy cheap fuels (ever heard of some unfiltered sulfured octane rating 80?)! As we were searching every service station, we were also followed by two separate drivers who cared about nothing besides getting multiple pictures of the bike. We got used to random pictures over time but having a series of phones stuck in our faces while trying to get information from gas station attendants exceeded annoying, especially when several film-makers continue to follow you blind-driving in several cars for several kilometers…. 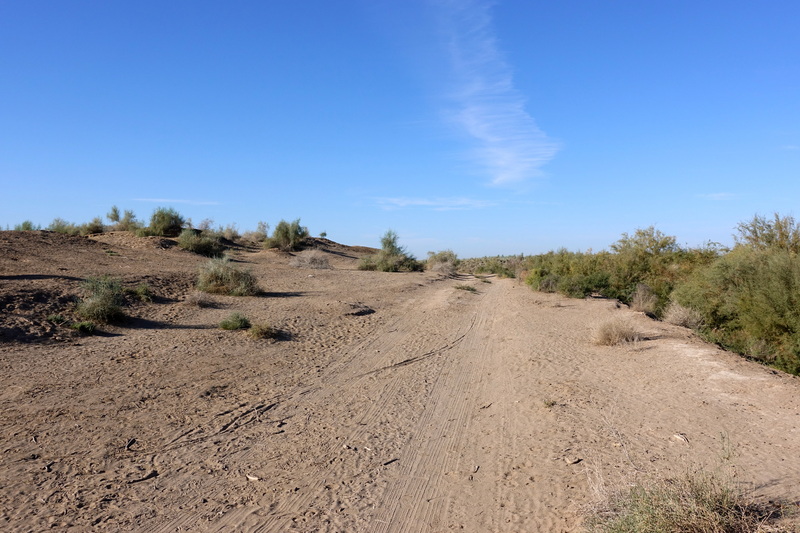 About 10 kilometers outside of the town, the steppe was turning into a real sand desert, so we followed a dirt road to where it looked good for camping (i.e. protected from the wind and far enough from a road to be incognito). As we were making our dinner, two shepherds and their dogs showed up (the dogs first, barking at us furiously) to see what we were doing. We were obviously wrong at believing that no one would find us there in that corner of the desert. But here, generally, no one cares whether you camp on their land, especially if you smile, are in a good mood and try to make a conversation in whatever language you feel like – and usually at most, they’re amused to see cyclists. We exchanged a few words with the shepherds and then went to sleep for the night. 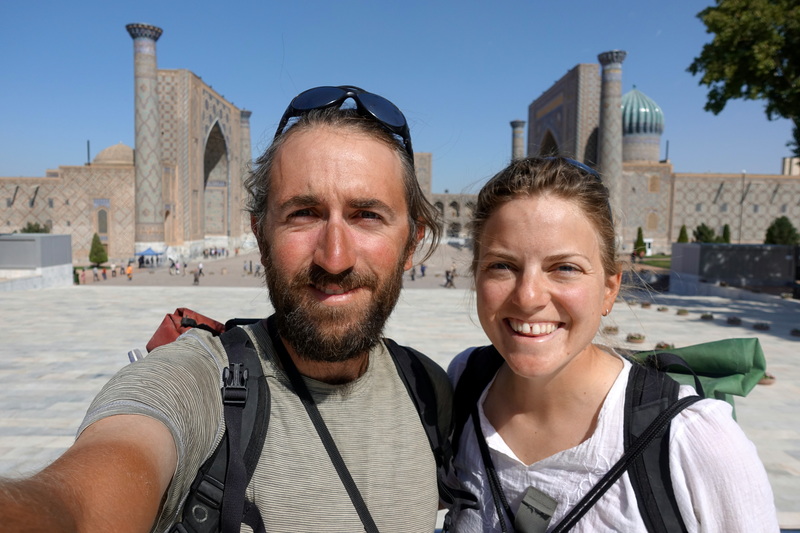 The next morning, we got up and cycled the last 50 kilometers to Bukhara. 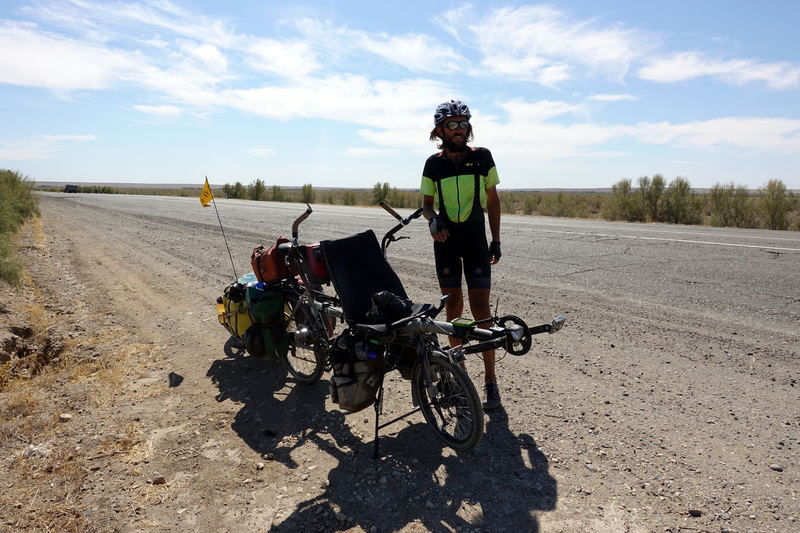 Along the way, nothing too interesting happened – we cycled over a few small hills and through the steppe, with cars enthusiastically honking every few minutes. 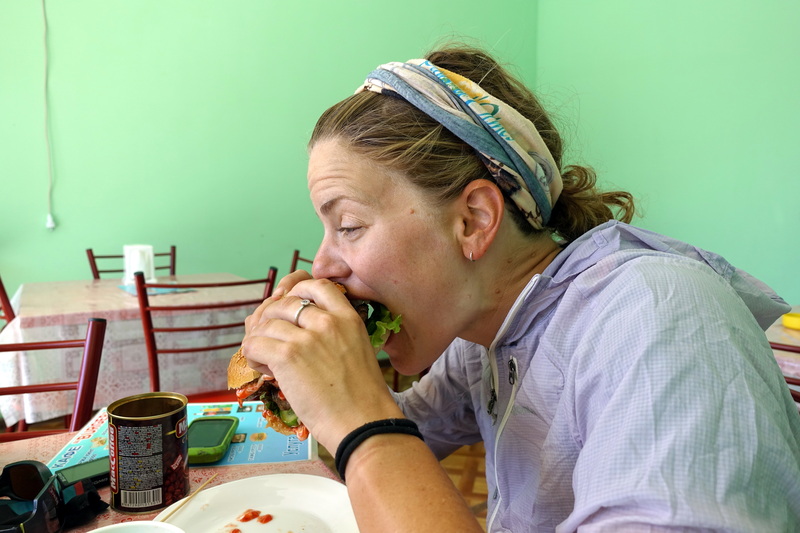 Before we rolled into the city, we stopped for a burger lunch – finally, FINALLY an option that wasn’t meat skewers or mutton stew (sorry for local recipes!). 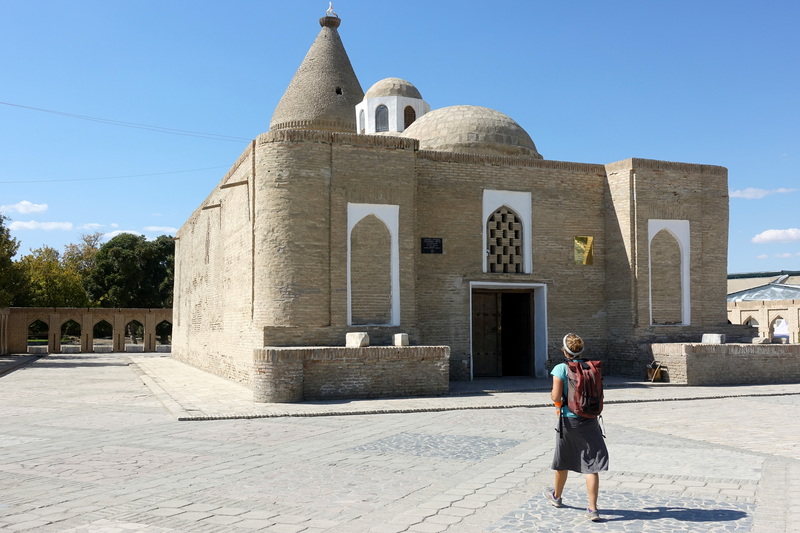 Now satiated, we continued cycling the last few kilometers on the busy roads to our guesthouse in central Bukhara. 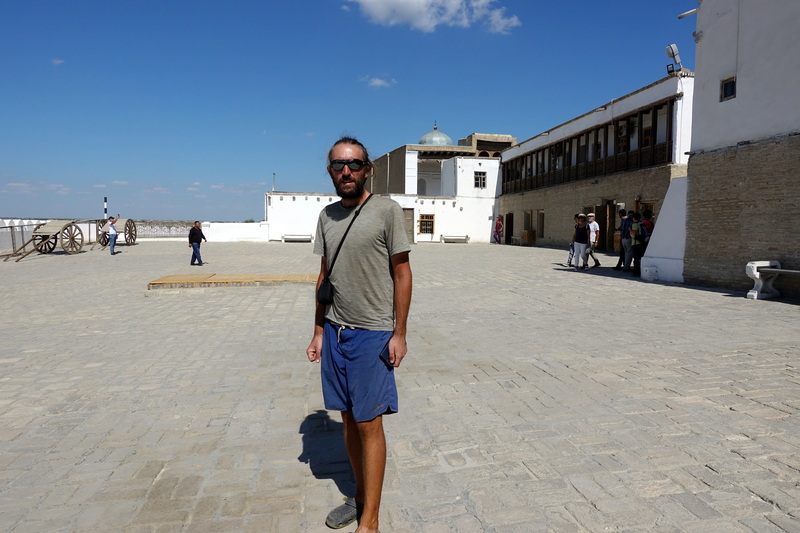 Once we reached our destination, our stomachs took a turn for the worse, so we spent a large part of the afternoon visiting the bathroom and complaining about our situation. By nightfall, we figured that we should see the city, so we walked to the main square and found another restaurant that didn’t serve “national dish, Plov.” We had so much of an aversion towards Plov that whenever a restaurant tout was trying to sell “the national dish” we would just smile and know that we would boycott that place. Again, Plov is not inherently that bad, but after two months of it…well, just imagine eating spaghetti-ketchup twice a day for a couple of weeks! 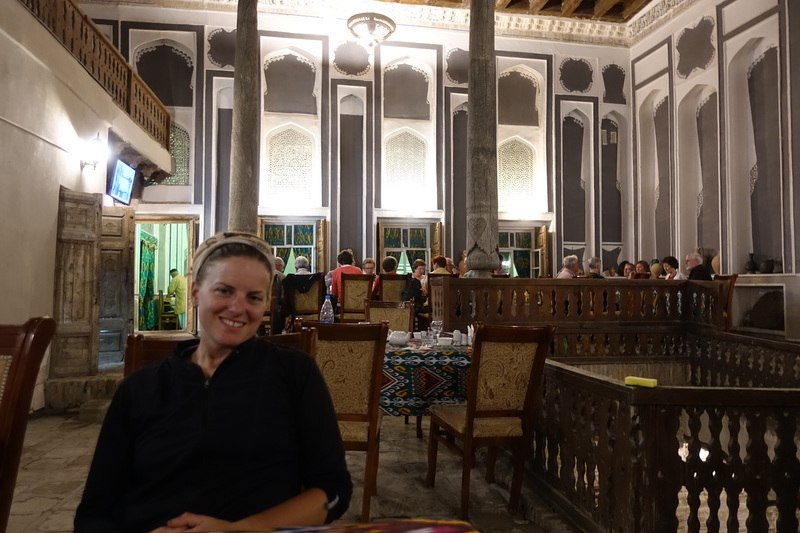 We found ourselves eating dinner in a nicer atmosphere compared to Samarkand- older buildings still existed with their original architecture – rooms with high, decorated ceilings and shaded courtyards. Enjoying a meal that doesn’t contain mutton. 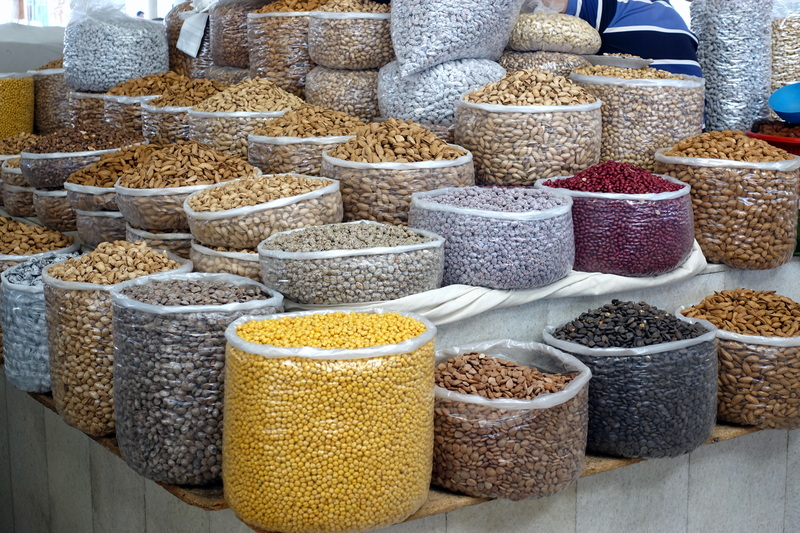 No Plov in this restaurant…but also no Uzbeks! 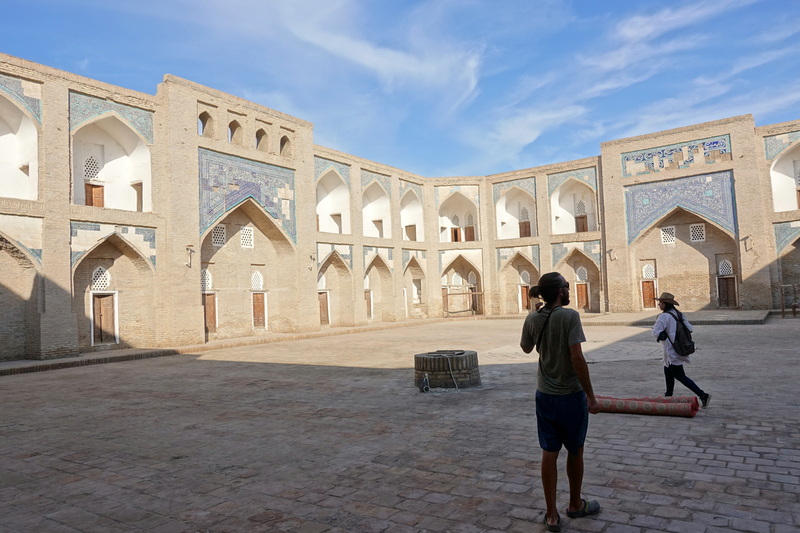 The next day, Cédric and I wandered throughout Bukhara and saw many of the attractions – the Lyab-i-Hauz, the Ark, and most of the madrasa and mosques. As in Samarkand, the souvenir vendors occupied the courtyards and were selling their (sometimes) handmade wares – after seeing so many carpets, pillow covers, silk clothes, etc., it was difficult to not want to bring something back with us, but the constraint of a 3mx3m on the bicycle trailer made us remain reasonable, although it would have been pretty cool to have a Persian silk carpet on the floor of the tent, right? Souvenir sellers. 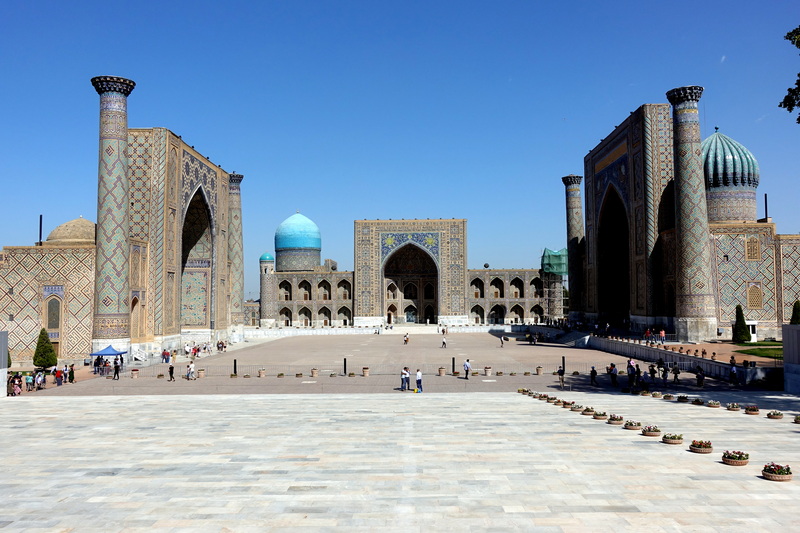 The average age of tourists in Uzbekistan is about double that of Tadjikistan’s. 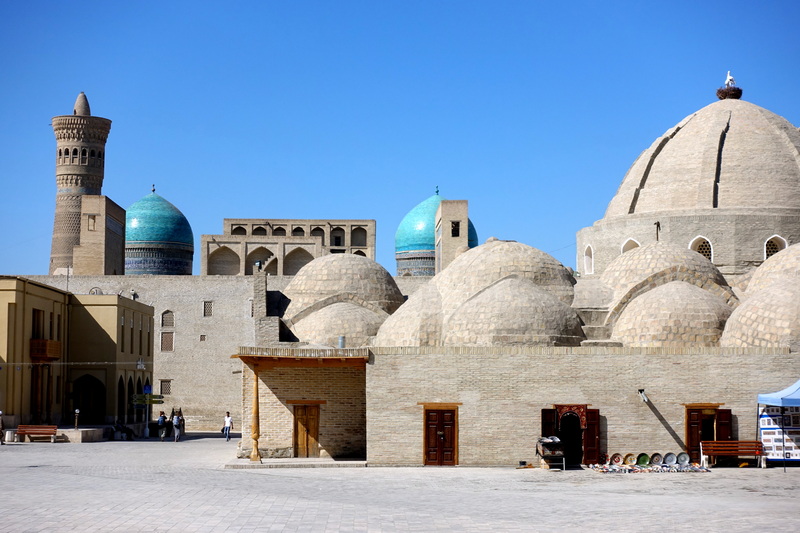 It is easier to go through Mosques than the Pamirs. 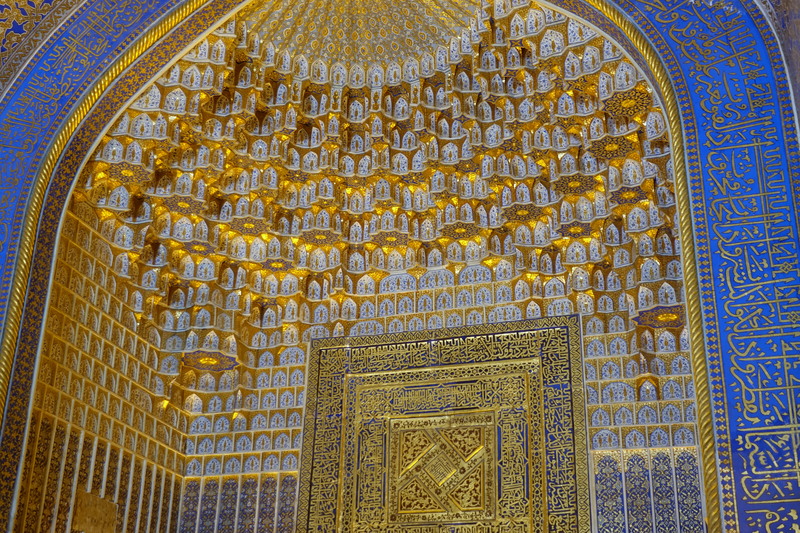 More madrasahs and geometric muslim art. 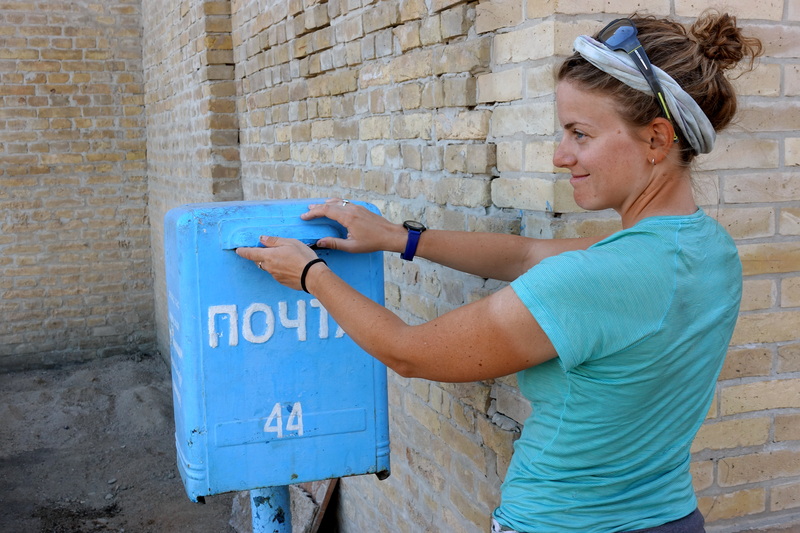 This is the first mailbox that we’ve seen in a long time… here’s to hoping that our postcards make it! 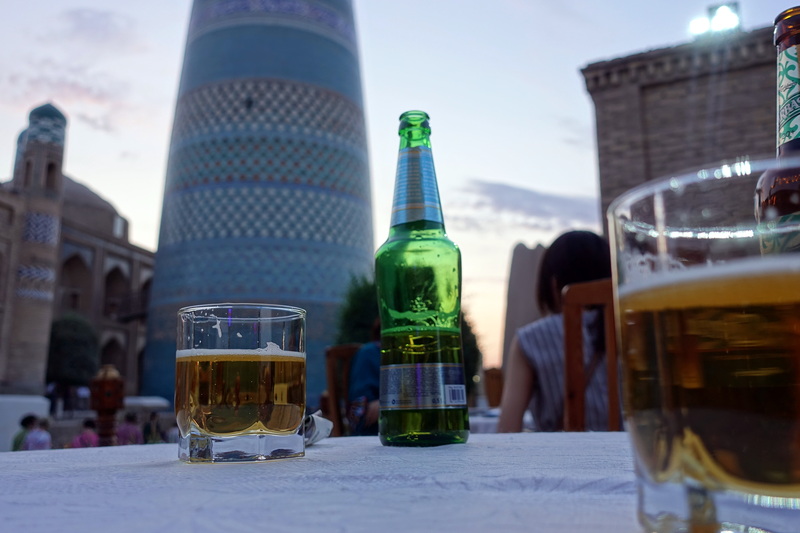 We ended our day with spiced tea and a dinner that didn’t showcase grilled meat (I think I even managed a vegan meal, a big challenge in Uzbekistan). A chocolate cake for Cédric. 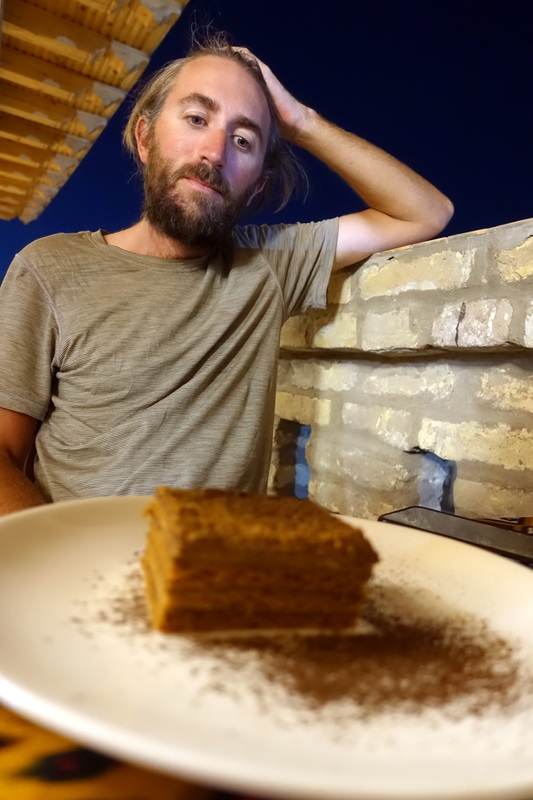 We cracked the budget on a fancy very-improved (although it’s not too difficult) meal! 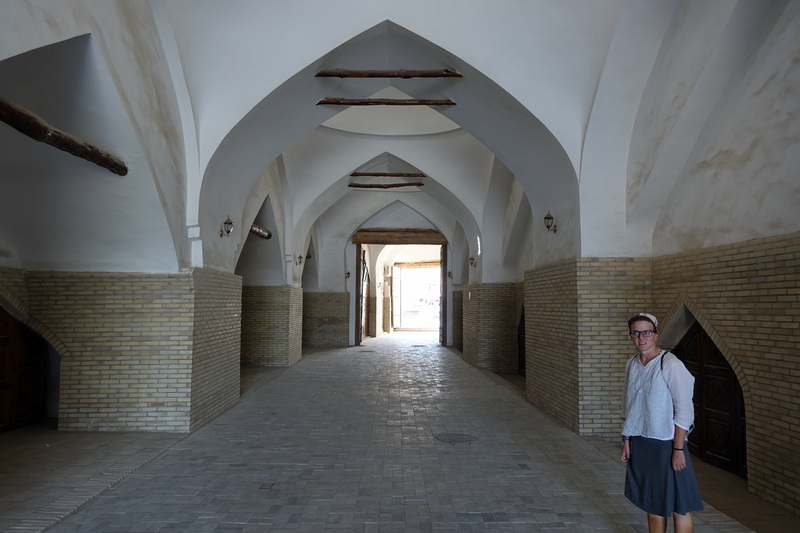 Eager to see more of Uzbekistan’s cultural highlights and less of the desert, Cédric and I decided to take a taxi to our final touristic destination in the country: Khiva. 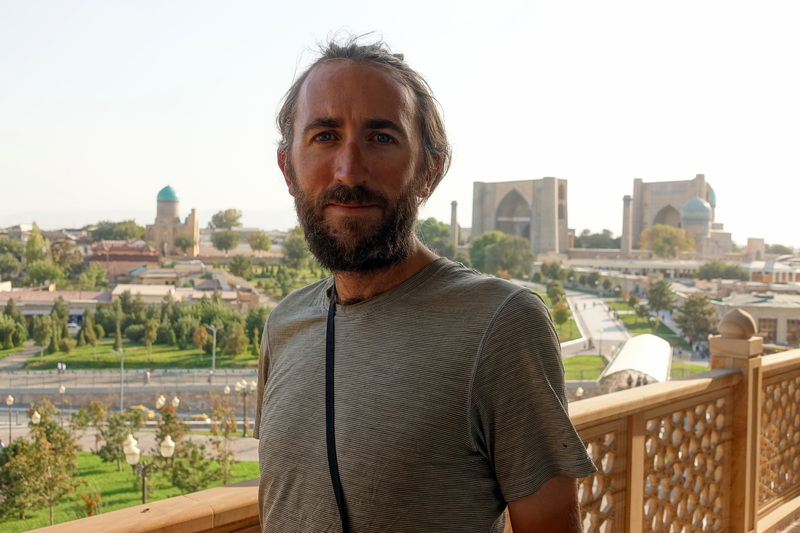 After weighing our options, which was either cycle the 450 kilometers in the desert or somehow manage other transportation (either train or taxi), we opted for the easier route. Reading a few trip reports of other cyclists who took the train, it wasn’t certain that our bike would fit, and trains run only a couple of times per week. So taxi was the last option, and surprisingly taking a taxi for 6h isn’t much more expensive than two train tickets. We told the guesthouse owner our plan and he offered to call a guy he knew to drive us. Before the driver arrived, I envisioned him driving a large SUV with great suspension… but, as luck would have it, he showed up with a Lada well into the six-digit kilometric figures. Rolling with the cards we were dealt, we mounted the Hase Pino to the top, roped it down, and hoped for the best. At 9:30 in the morning, we were off, flying down the highway and blasting 90’s Eurodance music (our driver chose the music, although my inner 8-year-old commended him for the Ace of Base and Aqua tunes). Somewhere along the way, we passed a lonely Italian cyclist and filled up his water bottles. He told us the ride was boring like you can’t imagine (we could imagine very well, even flying at 120km/h was seriously dull) but he had lots of time before meeting-up someone in Kazakhstan. 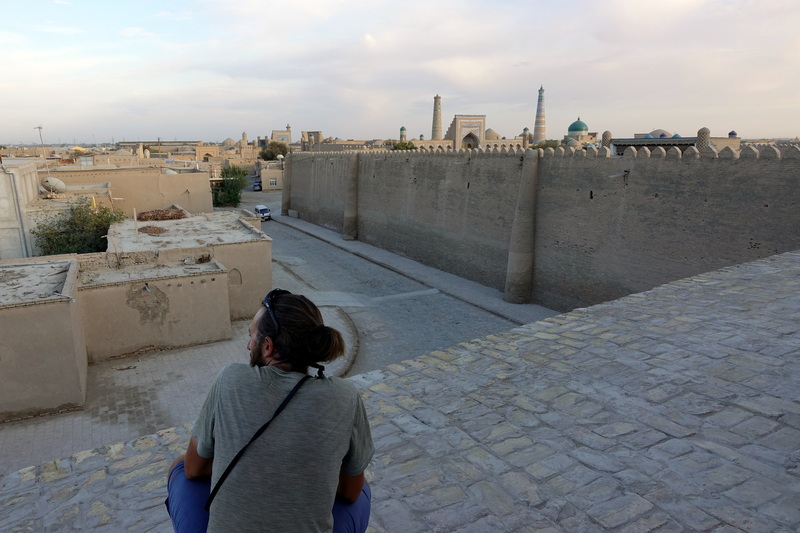 In the late afternoon, we arrived at our guesthouse in Khiva and quickly wandered to the walled city to sightsee before sunset. 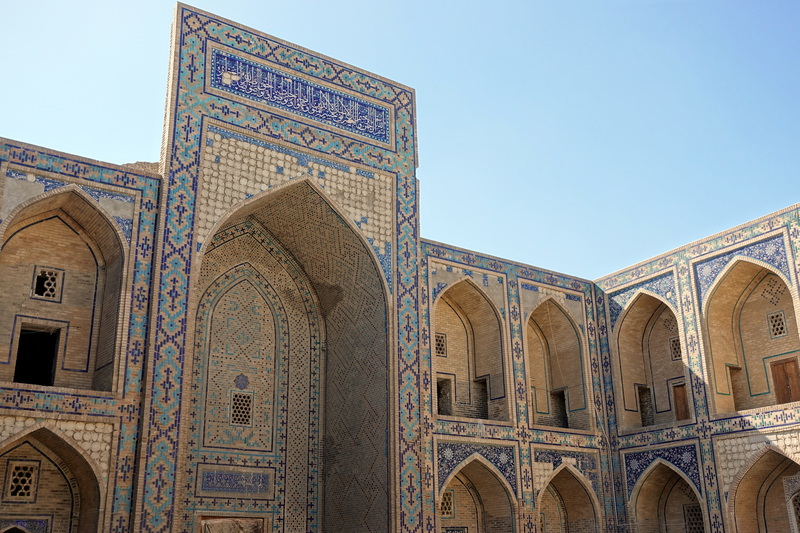 Just like Samarkand and Bukhara, there were multiple tiled madrasa that spotted the city, but in Khiva, there were also a few palaces and mausoleum to visit. Just as the sun was setting, we walked along the city walls and had a great view with all the building aglow. Khiva has put in place a one-ticket for the whole city monuments (outrageously expensive), but the employees in charge of controlling the tickets are also outrageously lazy (plus most of Western tourists have guide and travel in tours which pay the fee), so we just decided to look determined, walk-in and go from a palace to madrasahs and other monuments for several hours without having ever had to pay anything. Khiva was yet probably the city we enjoyed the most as it has kept a more authentic character, monuments haven’t been too modernized and upgraded (like in Samarkand where it felt a bit like an amusement park), there are a lot less tourist-groups (it takes a while to drive there and they would probably have to drive the same way back towards Bukhara). 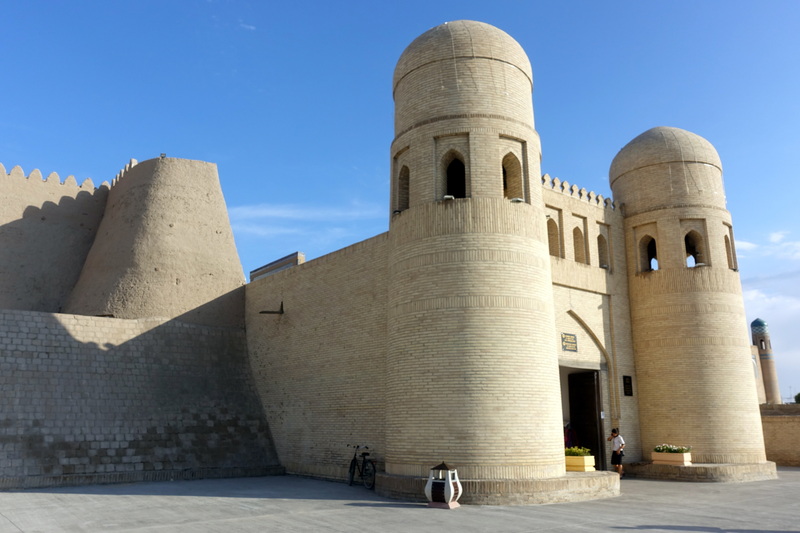 Khiva is so remote that it has maintained a smaller city character, that has in addition banned cars from its historic center (yuhhuh!). 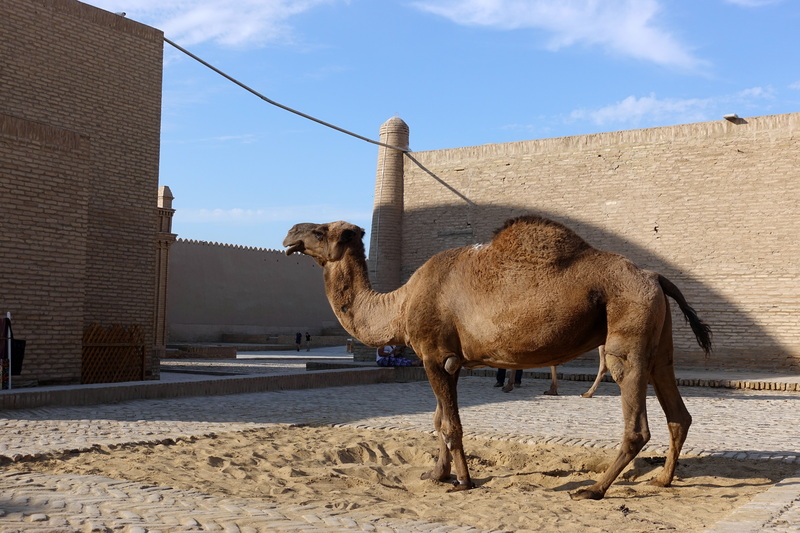 You could almost imagine some caravans of dromedaries reaching the oasis after days of thirst between the Karakum and Kyzylkum deserts (both combined are about the size of Texas or France). Ahhhhh – your many bouts of ‘multi-directional’ food – – I feel for you two – – how unpleasant that must be – – but troopers you are, always ready to take on the challenge again! You should have ‘cast-iron’ stomachs by now!! We surely now have a larger variety of bacteria in our bodies!